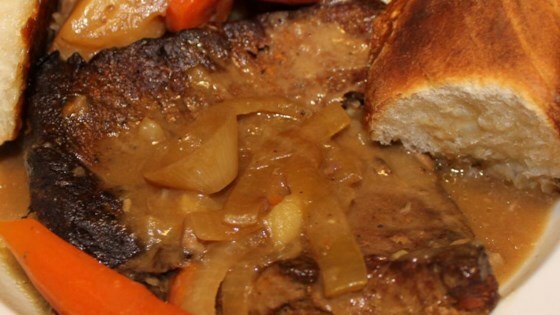 "This recipe came from the desire to make a pot roast, but all I had on hand was a London broil. I made this on the fly, and it turned out great. My wife took the leftovers to work and everyone wanted the recipe. I hope you all like it." Scatter sliced onion in the bottom of a slow cooker, then alternately layer carrots and potatoes. Heat oil in a large skillet over medium heat and season London broil with Creole seasoning. Sear beef in hot oil until well browned, 3 to 5 minutes per side. Transfer meat the slow cooker. Pour beef broth, cream of mushroom soup, and red wine into the skillet used to cook the beef and bring to a simmer. Scrape any brown bits from the bottom of the skillet with a spatula. Pour broth mixture over beef. Cook on Low for 8 to 10 hours or cook on High for 6 hours. Make your own Creole seasoning: Combine 2 1/2 tablespoons paprika, 2 tablespoons salt, 2 tablespoons garlic powder, 1 tablespoon ground black pepper, 1 tablespoon onion powder, 1 tablespoon cayenne pepper, 1 tablespoon dried oregano, and 1 tablespoon dried thyme in a jar. If the gravy is thin at the end, combine 2 tablespoons cornstarch plus 2 tablespoons cold water; mix well. Remove meat carefully and slowly stir cornstarch mixture into gravy, repeat until desired thickness is reached. Very delish!! Omitted wine and did add a couple extra potatoes. Nice on a cold day. Making a London Broil like this was awesome! The only thing I did different was use Red Cooking Wine. I sliced up the meat and we ate it rolled up in tortillas. Tastes great. Made as is. Very easy.